I found this idea on Pinterest months ago and it made so much sense to me. 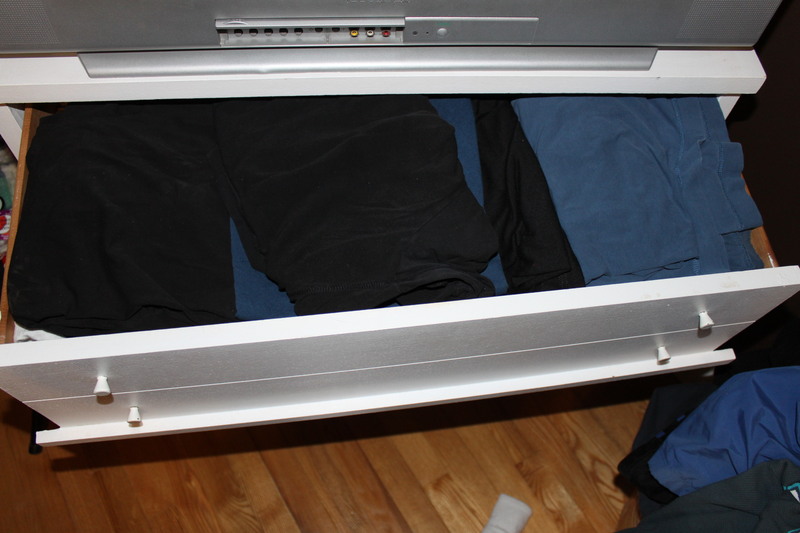 Don’t you hate it when you go to dig a t-shirt out of your dresser drawer and you either can’t find it or you mess up the whole stack trying to maneuver it from the bottom of the pile? I used to hate that! Not anymore, I decided to rearrange my clothes in a vertical formation as suggested on Pinterest. It works beautifully! So, if you are in the mood to get organized, you have got to try this. It really works and is easy to manage. The above photo is actually of my husband’s dresser drawer. He has so many t-shirts wedged in there, you can barely open and close the drawer. He has not yet converted to the new system. You can only see the shirts that are on the top of the pile and it is difficult to get a shirt in and out, let alone find the one you are looking for. Fortunately for him, he really only wears blue and black, so I guess pretty much any one will do! Okay, this is seriously a “no-brainer”. You can see every single shirt in the drawer and they fit in there beautifully. This system gets 5 stars from me! I love that I can easily find what I am looking for without destroying the whole drawer of clothes. A must do for the organized person in your home! Posted on January 4, 2014 by Cindy Roy •	This entry was posted in Life Hacks, Organization and tagged dresser organization, getting organized, how to organize your t-shirts, rearrange your dresser drawers. Bookmark the permalink.